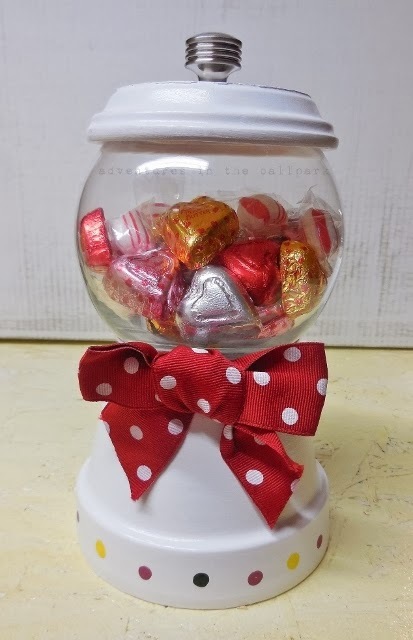 Mormon Mommy Writers and Friends: Valentine's Day Gift Idea - Sweet! Valentines Day is around the corner, and I have a cute craft to show you. You can make it for your hubby, his office, your office, your child's teacher, a doctor's office, anybody to whom you'd like to say "I love you" or "I appreciate you." I saw one in my dentist's office yesterday. I finished my own tonight. It's that easy and quick. This sweet candy jar is made from a Terracotta flower pot with saucer and a glass bowl I got at the dollar store - for a dollar. The flower pot was 59 cents, the saucer 77 cents, both at Home Depot. The top knob was three dollars. I used paint and ribbons I had on hand, so my total for this was $5.36. Here's the back side, which exhibits a smaller bow, if that's what you prefer. 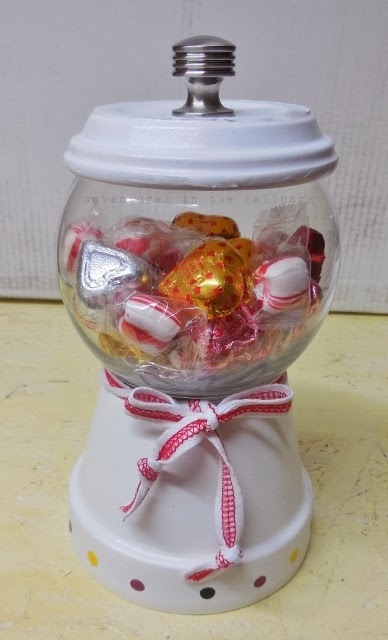 As this is not a craft blog, I demonstrate how to make this candy jar on my blog here: DIY CANDY DISH. Check it out if you're looking for something fun and easy and sweet for Valentine's Day. I'm already working on another one. By changing the ribbon and the type of candy inside, this little gem can be used all year 'round. I won't be posting until after Valentine's Day, so I'm hoping you are blessed on the 14th. I hope you get some hugs and some chocolate and maybe some surprises. There's nothing wrong with a holiday that forces us to be thoughtful and kind for a day. I thank God that He first loved us. Without His investment in the human heart, we would never know what love truly is.